It was a normal, random day and my brain suddenly hit a brick wall. I was bored. Like a bored panda, just laying on the couch with two bored baby pandas sitting on the couch with me. We had to do something, STAT, before our butts began to expand to fit the couch better. Plus, winter was officially over–it was 95-degrees out. So, yeah, we got outside. 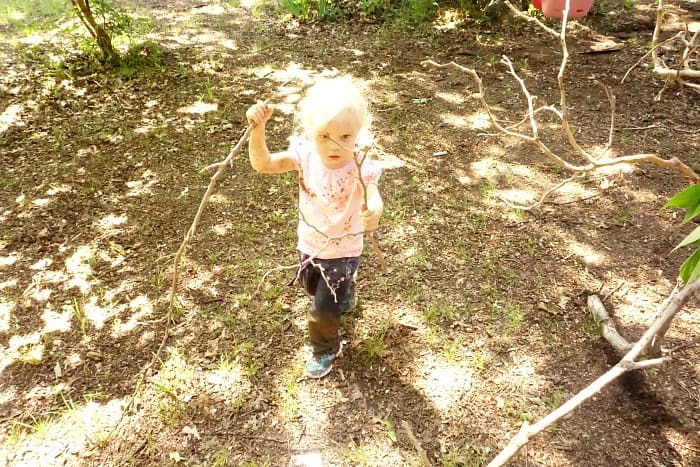 And we did some engineering with this awesome “Building a Stick TeePee Simple Outdoor STEM Invitation to Play” that we seriously put together–well, together. Heh. Look at how serious she is! I mean, seriously, she’d been out there about an hour, with little or no urging from me to keep going. 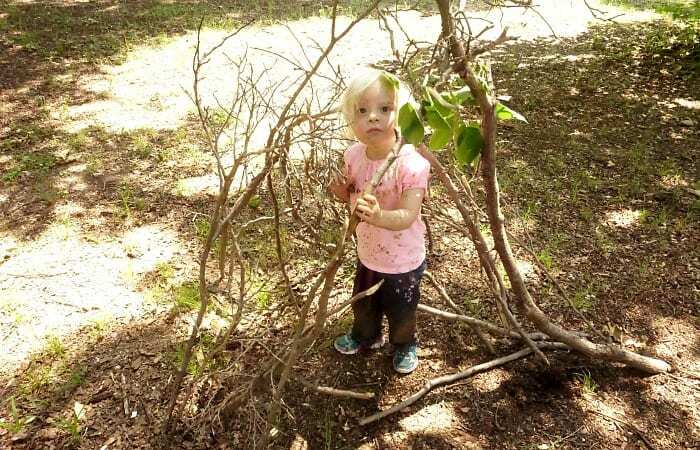 This Stick TeePee was so easy–but fun and had her thinking about leaning things together and building…and then climbing inside. It was awesome. First, have your child choose where your teepee will be. You need a large, flat, open area, but let them choose. Remember, this is their engineering project! LOL! Gather the sticks into a pile. 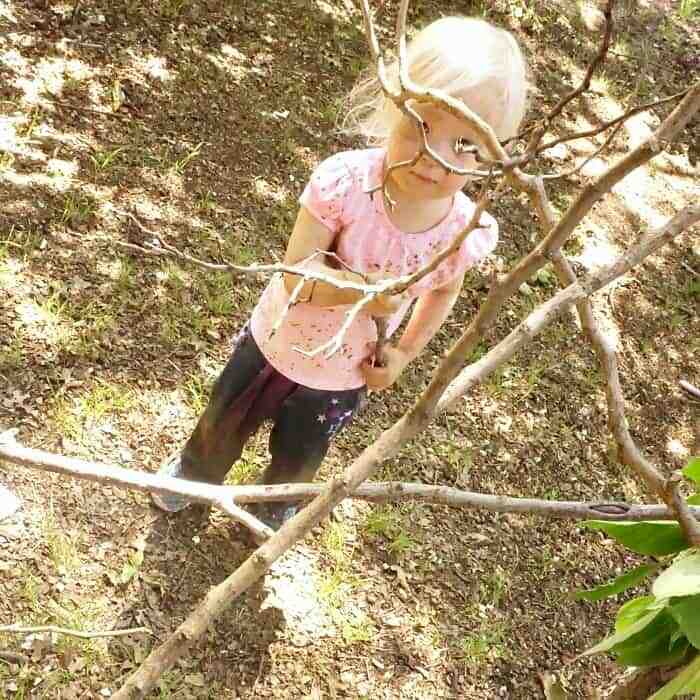 Gather sticks as long as your kiddo will. This is an easy task that they can pick back up later, if they want to, but you need at least 3 to get started. Find a suitably long vine or green sapling branch–about a foot long or longer. But don’t get into the poison ivy. No vines that might make you sick. Heh. Place 3 sticks together at the top and far apart from each other on the bottom, pushing the bottoms into the dirt, if possible. The three sticks should be leaned against eachother for long enough for you to wrap the top together with the vine/sapling branch. This is the real engineering part here…The way the teepee comes together is the challenge. Your kiddo might need to replace the sticks, lean them a different way, or even hold onto them while they wrap the top. Once the 3 primary sticks are up, your kiddo can start putting the other sticks together around the teepee. Let them go–let them do whatever they want. At this point, the engineering question is “will it still stand”. And it’s just about balancing the teepee. 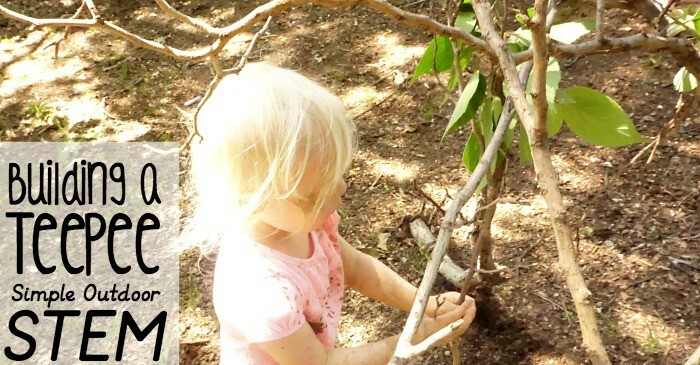 So, what do you think about this stick teepee STEM activity? Is this something you would do with your 2 year old? I’d love to see pictures! Just leave me a comment below! LOL!